Shift architecture urbanism has redesigned a historic family house in the indies neighborhood of amsterdam to maximize its relationship with both the street and its garden. 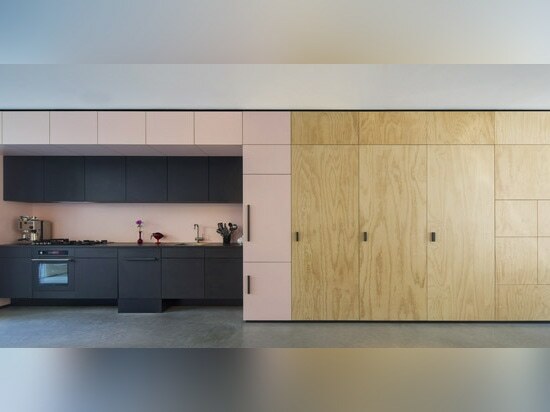 A multifunctional wall cabinet, 14 meters in length, plays a key role in opening up the ground floor. the idea was to create a loft-like entrance by eliminating any walls and using the cupboard to house all the functional elements. 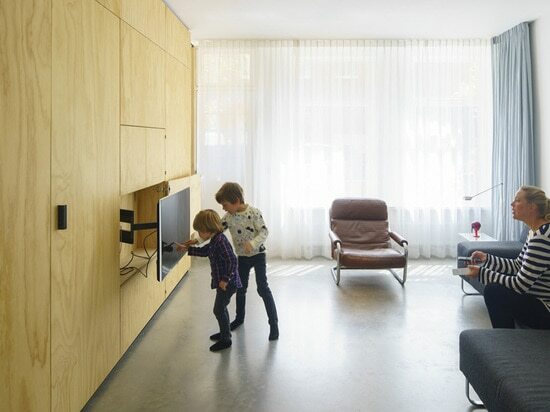 to emphasized the relationship to the street, one enters the house directly into the open living space and can immediately see the garden in the end. 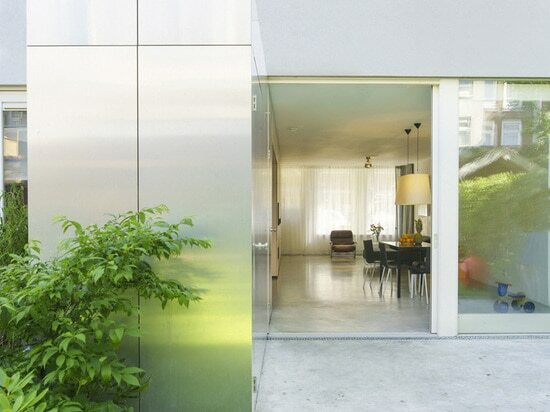 thus, the house is linked to the attractive sidewalk with its vertical gardens, typical for amsterdam. the seamless continuation of the indoor living area into the private garden is guided and strengthened by extending the wall cabinet into the garden defining a private terrace. 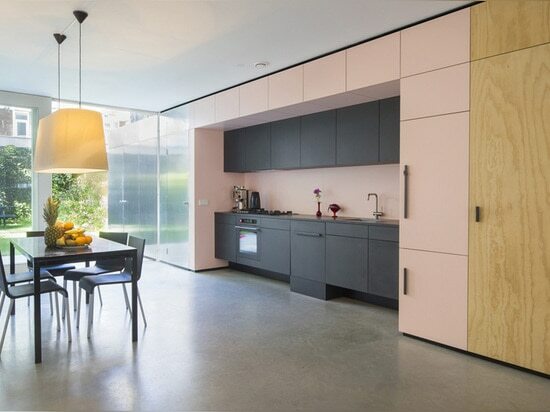 the juxtaposition of three contrasting finishes for the cabinet differentiates the main living space. 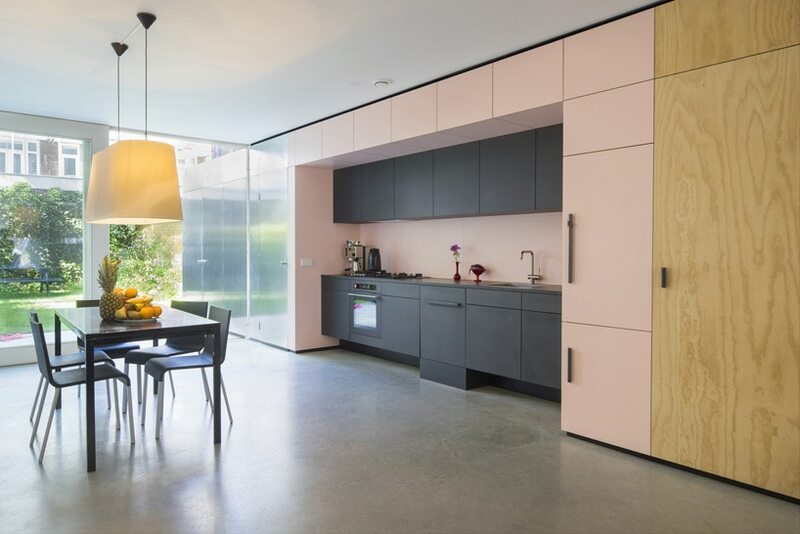 each material provides the space with a specific character that connects to its use: a warm plywood for the living, a sanitary pink laminate for the kitchen and dining area, and a weather resistant anodized aluminum for the terrace. 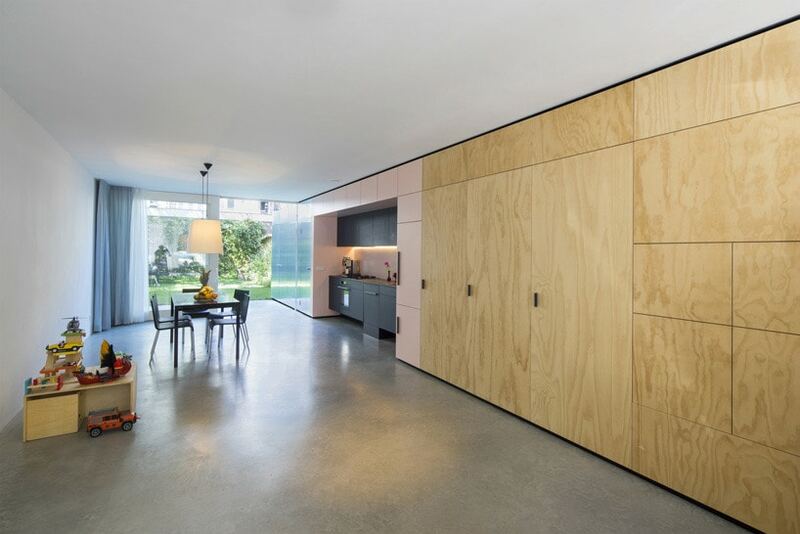 the plywood section of the cabinet integrates a small winter-entrance, a stair, tv & audio and a wardrobe. 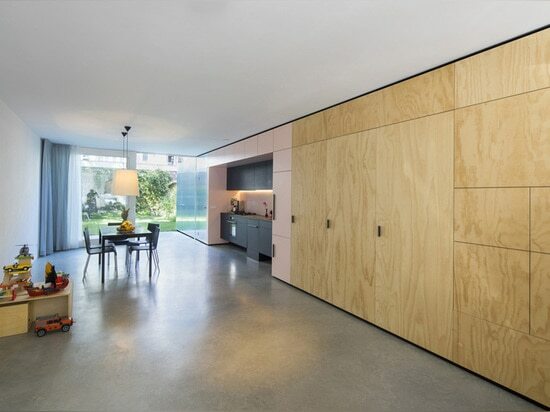 the part in pink laminate contains kitchen appliances and cupboards. 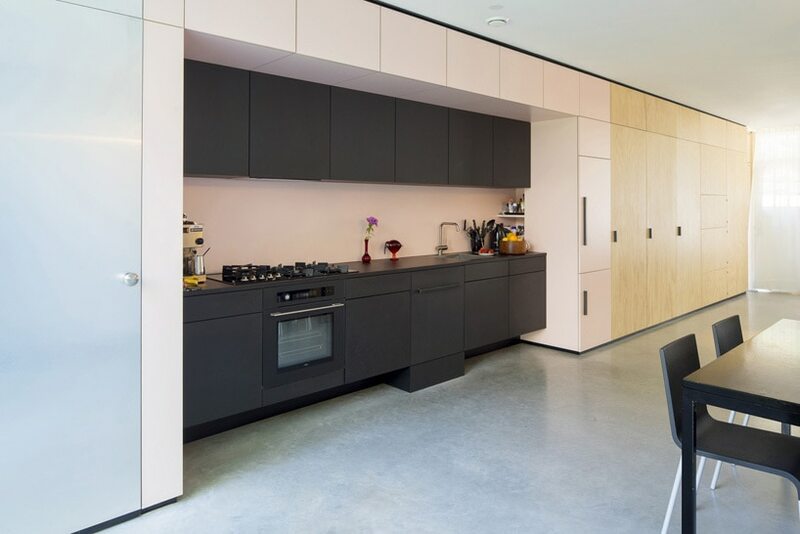 its arch-shape makes room for a recessed kitchen in black MDF. 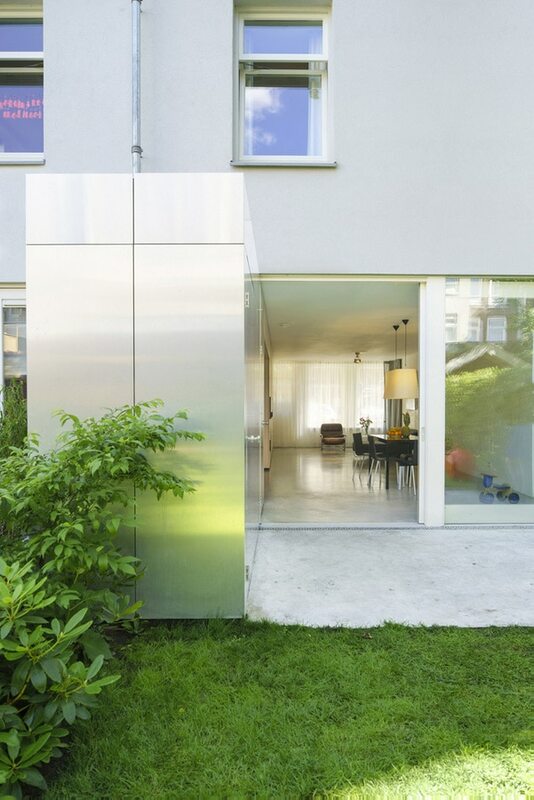 the last piece in natural aluminum accommodates a toilet and a garden storage while its cladding characteristics reflect the garden vegetation back into the house, enhancing the experience of the private garden, a true luxury in the old neighborhoods of amsterdam. in contrast to the common use and open character of the ground floor, the two upper floors are divided for a functional layout of individual rooms for this young family. the first floor contains a working space, a master bedroom with walk-in-closet and a bathroom for the parents. the second floor contains three small bedrooms and a second bathroom for their three kids. ‘open house’ is an example of how the dutch inner city housing stock can be adapted to the needs and desires of young families with kids, avoiding them to leave the city for its lack of outdoor space and appropriate dwellings. urban residential areas such as the indies neighborhood should house multiple generations, cultures and incomes to remain attractive and socially sustainable.